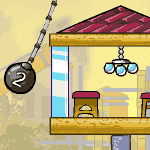 Obliterate the structure in each Building demolisher level by using the limited number of demolition balls at your disposal. Don't waste your wrecking balls, because you may die in Building demolisher game if you are not careful enough. Aim under the right angle in order to do as much damage as you can in Building demolisher game.